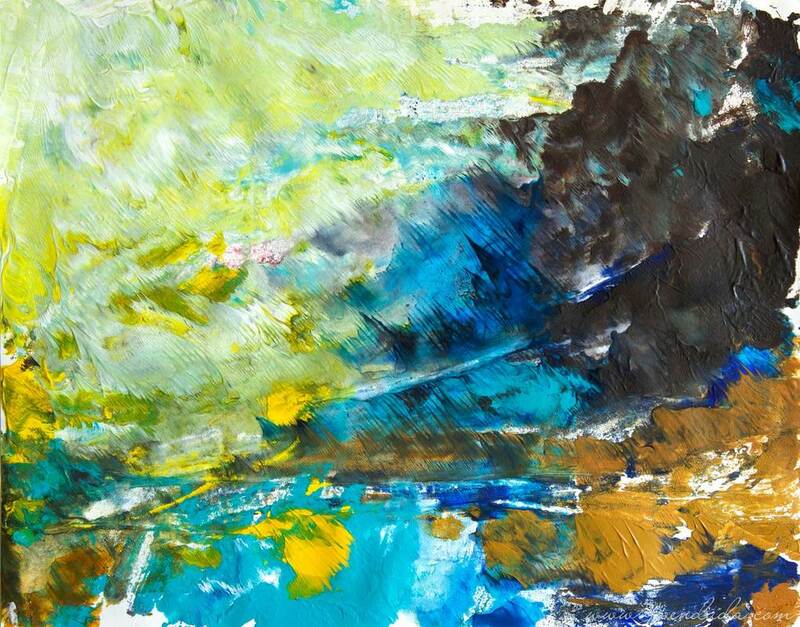 Titled "Tempestuous Sunset" this 14" (35.56 cm) x 11" (27.94 cm) original acrylic monoprint has a lot of movement with colour leaning in and up from the darkened shore in colours of ultramarine, teal and turquoise blue and yellow ochre with the sky a light and verdant green with a bold yellow sun grazing the horizon. That is what I see, a tempestous light green sunset over the Algonquin treescape and rocky shore. Signed and titled on the back. The image goes right to the edge of the paper and it is signed in the lower right hand area. Done in professional artist Golden and Winsor & Newton acrylic paints. The process of monotype printing is one in which paint/ink is put down on a plate (plexiglass, etc. ), the image is constructed on that plate, paper is put down on top of it, pressure is applied to the back of the paper and then the paper is pulled off the plate. The image is then transferred onto the paper. This can be done once or over and over to construct an image. This results in ONE print only. Once this print is gone, it's gone. Done in lightfast and archival-quality top of the line professional Golden and Winsor Newton artist paints.